Today really helped take my mind off winter and aim it towards spring. 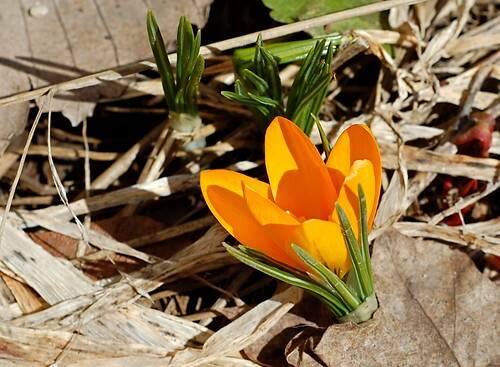 First, this eager little crocus raced from nowhere into full bloom! It was only wide open like this for about an hour or two, then it started closing. I took this photo just before I backed my MZ Baghira motorcycle out of the garage and went for a delicious 20-mile ride. I didn't go anywhere in particular, I just kept to the main roads and tried to avoid wet areas (too much salt left on the roads)and the omnipresent sand in all the corners. It was enough simply to be out riding for a bit. Other than my short shakedown ride yesterday, I have not ridden since before Thanksgiving. That's a long non-riding spell for me. Glad it's over!